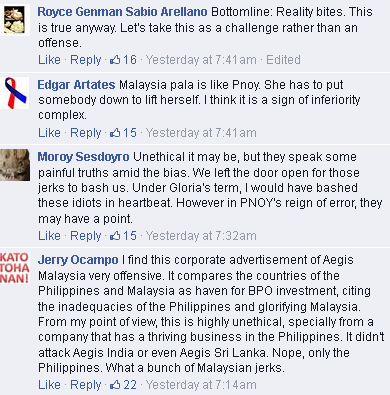 A BPO company that did business in the country trashed the Philippines in a video presentation (not promotional ad as other blogs cited) and glorified Malaysia’s “world-class” infrastructure. Aegis once did business here until it was acquired by global outsourcing giant Teleperformance. The video is too long for a typical ad, so it must be a company video presentation intended for Aegis’s investors and stakeholders. It was not intended for general audience. Obviously the presentation was intended to convince the company investors– and other potential investors– to choose Malaysia as their investment destination, which is just fair and understandable. Unfriendly climate– Are you freakin’ kidding me? If that’s the case then why do technology companies flock to Israel? Less security— This seems legit since President Nonoy Aquino had indicated his willingness to sign the suicidal Bangsamoro deal. This is one good reason NOT to invest here. Lack of government support– Are they referring to high taxes and regulations in the PH? To be fair, Malaysia was ranked 6th in the World Bank’s Doing Business Index. 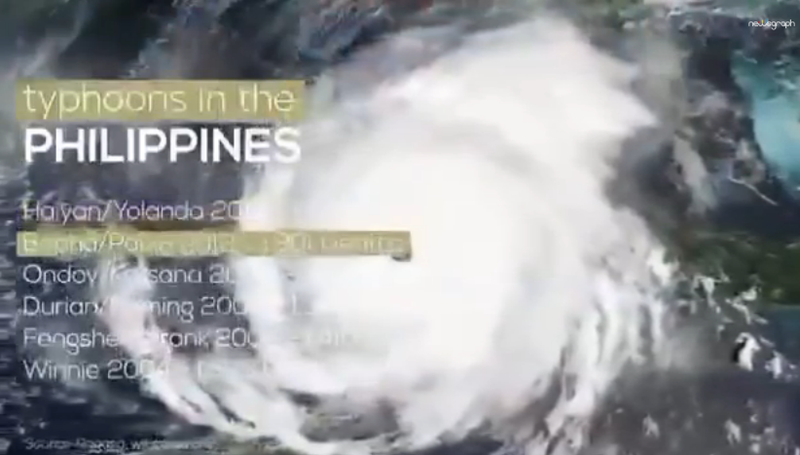 The Philippines was ranked 108th behind Kuwait (104th), Nepal (105th), Believe (106th) and Grenada (107). A high ranking on the ease of doing business index means the regulatory environment is more conducive to the starting and operation of a local firm. The thing is, they didn’t even cite PH’s protectionism and too much regulations as the best reason not to invest here. Well, perhaps it’s because the BPO industry is exempt from our protectionist laws. While I agree that the Philippines’ business climate is hostile to both local and most especially foreign investors, some of the reasons (e.g., unfriendly climate and lack of government support) cited by Aegis Malaysia are just lame and stupid. What do they mean by ‘government support’? Is it subsidy, loan or political protection? Meanwhile, the Philippine embassy in Kuala Lumpur asked Aegis to explain why it released the video and to prevent its spread online. “The video is circulating in social media and has raised alarm among netizens,” the embassy said. I think the Philippine embassy’s action is both lame and pathetic. If the video were released in the United States, the company could simply invoke the First Amendment. However, the embassy’s action shows our government and embassy officials’ blatant disregard of people’s and organizations’ right to free speech, even if that speech may be considered offensive by some. Now, some Filipinos can still boast, at least for the time being, about the Philippines being the third-largest English-speaking country in the world until some enterprising foreign investors finally develop a good business model designed to recruit and bring Filipino call center agents and applicants to Singapore and Hong Kong, whose regulatory environments are more open to investment and more conducive to the starting and operation of a local firm. I think there are already such BPO companies operating in Dubai that are trying to tap the best and most experienced agents in the Philippines. With its highly regulated business environment, high tax rates, rampant corruption, red tape, inconsistent labor laws and protectionist policies, the Philippines is unable to compete with its more open and business-friendly Asian neighbors.